Written by Julanda Clark - Club members from 9 of our Northeast Florida Boys & Girls Clubs participated in this season's FIRST LEGO League Challenge: Into Orbit competition, Saturday, February 2nd at the Main Library in Downtown Jacksonville. All 9 of our Northeast Florida Clubs made a strong showing, but members from our Arlington Community Academy Boys & Girls Club made such an impact they were awarded the Judges’ Award! This award is given to teams whom judges believe have exhibited unique efforts, performances or dynamics to merit recognition. Judges admire these teams for their amazing core values skills, hard work and teamwork. The award is also given to teams who were close to winning an award and deserve special recognition. 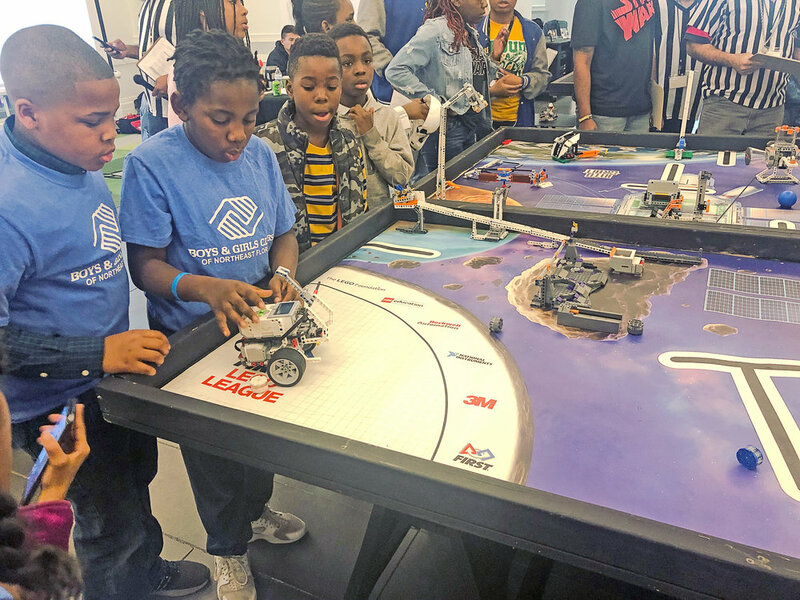 The STEM (Science, Technology, Engineering and Mathematics) programs offered at Boys & Girls Clubs of Northeast Florida helped prepare our Club members for this tournament. At our Northeast Florida Clubs, members engage in STEM-based activities, learning to build and program OZO bots and Lego Mindstorm robots. Our Club members are also introduced to programs like Power Point, Excel and Microsoft Word to help them stay ahead of the curve. This is second year Boys & Girls Clubs of Northeast Florida have competed in the event and we had 6 more teams compete than last year. We love being able to provide opportunities for our Club members to pursue their passions and learn all they can to become successful in their futures. We can’t wait to have more of our Northeast Florida Clubs compete in next year’s tournament and bring home more awards!